Positive parenting characterised by acceptance, warmth and sensitivity were found to be generally beneficial this year. Good parenting was found to be generally protective of emotional and behavioural resilience. The reverse of this, hostile parenting was found to be predictive of victimization by others or bullying of others, depression and behaviouralproblems. Generally parents were found to be moving towards a less directive style of parenting however there was still a need for a greater awareness of positive parenting techniques. An improvement in parenting was found to be linked decreased depression, higher self-esteem, higher future optimism and more school satisfaction in teenagers and parenting programs were generally found to be effective, although the question was raised as to the length of this effectiveness. The triple P parenting program was reaffirmed as being effective and the 1-2-3 Magic program was found for the first time to be effective. If you are unable to attend a class, online courses or self help workbooks were found to be equally as effective as course attendance. The deleterious effects of coporal punishment were again restated, being found to predict future child aggression, callous unemotional traits, mother-adolescent conflict and oppositional defiant disorder. These effects were more common when spanking was performed on younger children, high frequency or the children were already considered to be at high risk. Other factors found this year to increase anxiety and depression include features specific to the child and external factors such as being bullied, school difficulties and social isolation. 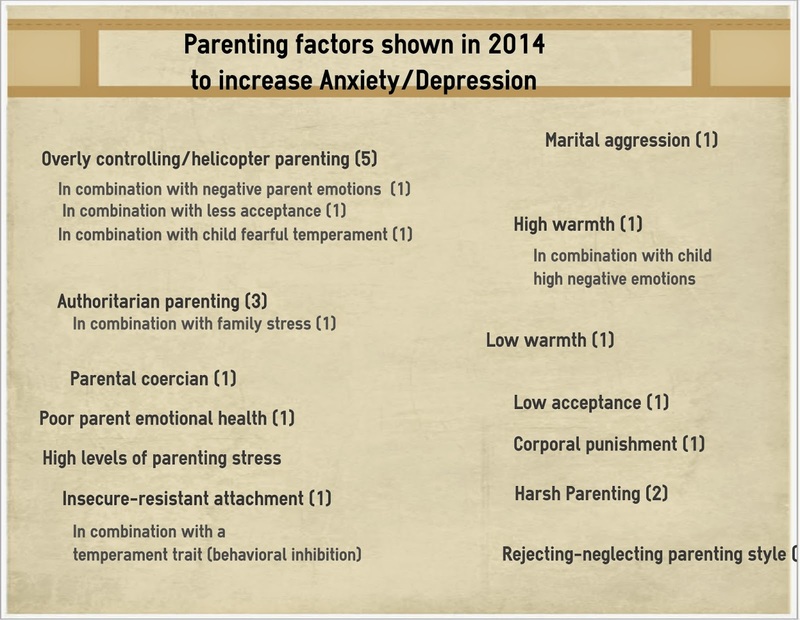 Positive parenting, authoritative parenting and the use of low levels of control combined with high affection were found to decrease anxiety and depression symptoms. Training of parents in emotion-socialisation was also shown to decrease these issues. Importantly this year several studies showed that few children and teenagers recieved adequate specialist care, primarily due to the problem not being recognised. Studies, however, produced methods to assist with this identifying features that indicate problems in particular the prescence of irritability and visiting websites encouraging self harm or suicide. In children, the prescence of acting out alongside symptoms of anxiety or depression was found to indicate that problems were likely to persist throughout childhood. The importance of looking after yourself was again restarted with studies finding more positive parenting in mother's who had less parenting stress and more support. However studies have also found that pre-set personality factors such as Optimism and other factors such as attachment to own parents were also important factors. Looking after yourself was also emphasised as remaining important even as your children grow, with one study finding that parents of school aged children had the highest levels of parenting stress. 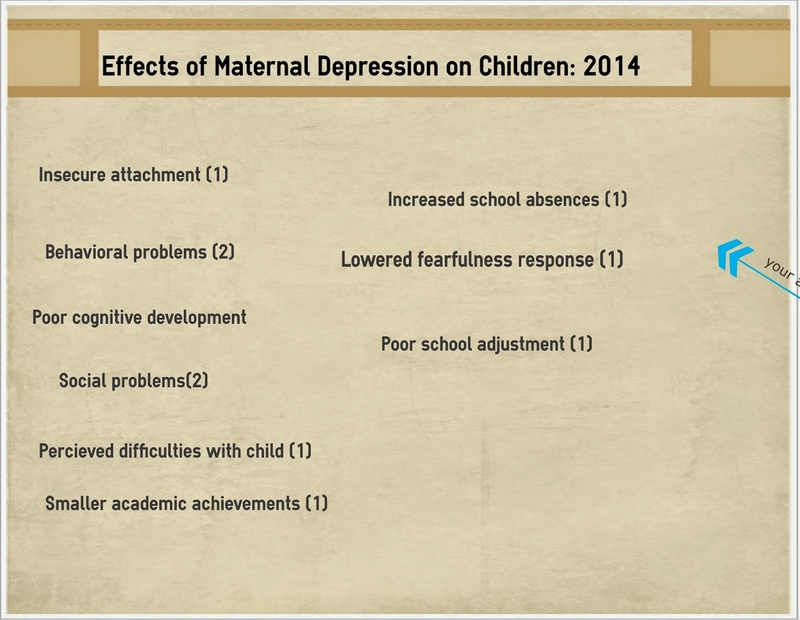 The importance of mothers ensuring that they get help for their depression was again restarted with a wide variety of issues found to be connected to post-natal depression. However the use of certain parenting styles including using authoritative or positive parenting and not displaying negative emotions towards the child has been found to offset some of these effects. It is also important to remember that depression is not limited to the postnatal period, with mothers of toddlers being found to be more likely to be depressed than parents of infants. For separated parents, the characteristics of the father were found to be more important than the particular custody arrangements. Authoritative fathers and where there were low levels of conflict were found to be the best situations regardless of level of contact. Fathers were also found to be particularly vulnerable to the effects of parenting stress in terms of their involvement. Long work hours, being the sole income earner, unemployment and workplace inflexibility have been found to be particularly predictive of this.